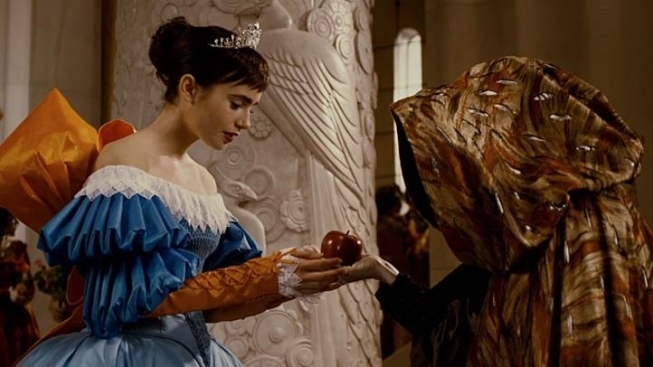 Collins, the daughter of music superstar Phil Collins, is every bit the modern-day movie princess with her turn as a decidedly feistier incarnation of Snow White opposite Julia Roberts’ evil queen in the off-kilter retelling of the familiar fairy tale. She tells PopcornBiz of trying on tiaras, learning her trade from a powerhouse roster of Hollywood actresses and hearing the familiar laugh of a certain pretty woman on set. Were you more nervous portraying Snow White or working opposite Julia Roberts? I know – there's so much iconic-ness in this movie! I don't even really think it hit home for me, before or while I was filming, all these questions that were going to come up. If I had been asked all of this beforehand it probably would've psyched me out a lot more because everyone is like, 'It's such a big deal,' and I'm like, 'Yeah. Had I thought about that before I probably would've psyched myself out before.' It's like, 'Am I doing it right? Am I doing it well enough? Who am I going to let down?' I never had those feelings because I was just so excited. I know that every young girl has their own version of what fairy tale princesses should be – I did as a kid. So when you're going to do a movie like this, my main concern was that I wanted to make her as real as possible, not a caricature of an animated film. So it wasn't living up to everyone's expectations of what Snow should be – it was that I wanted to make a girl that people feel could be their friend. Then, of course, you don't want to be ruining scenes with someone like Julia, who obviously is going to come to set so prepared, so ready and on the ball. The last thing I wanted to do was flub a line or not be prepared, and it says a lot about the crew and Julia and Tarsem [Singh, the director], in that they always made me feel so comfortable and I never had that fear once I hit set. It was just pure excitement – and really being nervous that I wouldn't break down into laughter and smiles during a scene because I was so excited to be there. Considering your costars in your last few movies and upcoming projects, it's like you're getting paid to go to the best drama/movie star school possible. 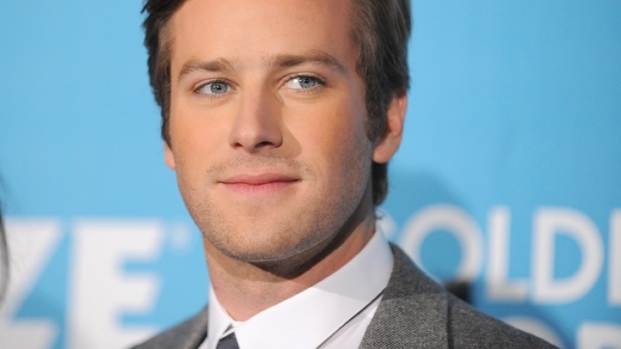 Armie Hammer chats with his wife about the elaborate "Mirror Mirror" sets, including which is his favorite. With Sandy, I remember a specific moment where we were sitting at the dining room table and she asks Michael if he wants to stay. He says, 'I thought I already was a part of the family.' She goes from being this chipper woman to really emotional and starts to cry and I remember asking her, 'How do you do that, in seconds – just go there?' Every take was the same, and she said, 'You really have to just exit everything else out, focus in on the moment, and I think of a song or a memory that really triggers an emotion and you have to block everything else out. It's not easy, but you just have to focus.' I remember thinking, 'It's so easy to say that, but then when it comes to doing it, it's a thing you just learn over time.' With Julia it was just mainly watching her, how she knows everything from lighting to camera angles to shots of how they're editing together, when she can deliver one part of a line and when to save it, and just kind of watching her take her surroundings in to then be able to better her performance. It was really interesting – It's not just about the lines you deliver. It's about your surroundings as well. And with Julianne, again, it was mainly just about watching her, but she treats everyone – hair and makeup, catering, fellow actors, the grips, the directors – the same. She brought on an ice cream truck for everyone just because it was a Friday. You're going, 'You're so cool!' She's just so herself and chit-chatty, and then the second the camera rolls, she's back to being in character and then she's herself again. Seeing her, I've run into her a couple of times since then and she's the same person. It's just so cool to see someone so unchanged, and yet this iconic woman in film. What's the one thing that you learned from Julia Roberts by working with her that you never would've guessed about her? 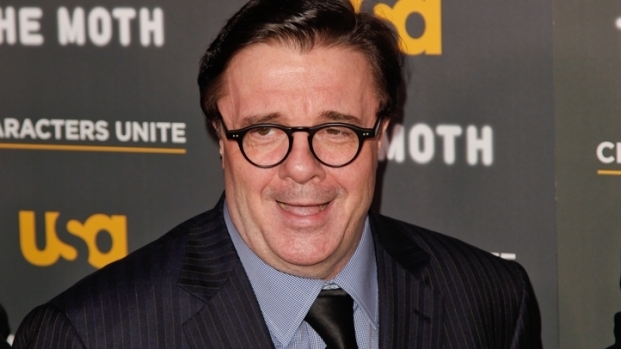 At USA Network and the Moth's "Characters Unite" storytelling event, Nathan Lane talks about working with Julia Roberts in "Mirror Mirror," and his reaction to the shocking death of Whitney Houston. She drinks a lot of tea – I noticed that! She drinks a LOT of tea. You know that laugh everyone thinks is just kind of a movie laugh of hers? That's her laugh. Like, she'll be on set laughing all the time. It's so funny because you feel like you're in a movie when she's laughing like that and you're off camera. You're like, 'That was the laugh! Cue the cameras!' But that's her personality. You grew up with fame and accomplishment in your life. So when people started knowing who you were rather than just being a jobbing actress, what did you remember from seeing it from the inside looking out that you wanted hold close as you got entered into fame? Really remembering to make sure that you let those who support know that you appreciate it. Like, being out and about, at dinner with my dad or at Disneyland or somewhere where someone comes up to you, someone that you've clearly affected and they just want a photo or an autograph or something, they just want to say thank you for what you've brought to them. And it's really just remembering to acknowledge those people that have supported you and got you to where you are. It's not becoming too big that you ignore that. I think that's a big part of it, appreciating those that got you to where you are. You got to be funny in this performance. Is comedy a skill that you'd like to show off more? 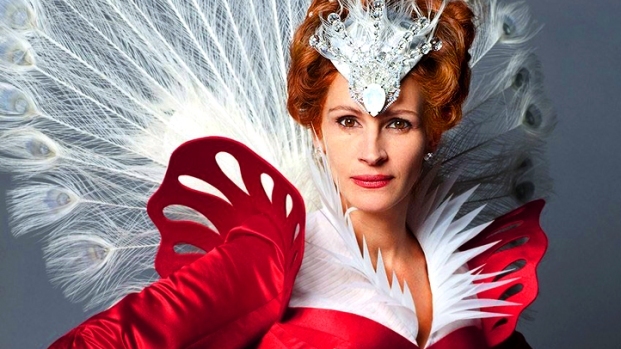 Julia Roberts In "Mirror Mirror"
Wicked and enjoying every moment of it, Julia Roberts is seen on the set of "Mirror Mirror" where, in her over-the-top ensembles and sitting regally on her throne, she embodied the evil queen by torturing poor Snow White. Definitely, yeah. Comedy is something that I really hope to be able to get into. It's very picky when you come to comedies, because some people can find something so funny that other people just don't understand. This was a character that at the beginning is kind of void of personality because she's locked away. She's innocent and wide-eyed, not sure of what's going on. She becomes feistier and she learns a lot from the dwarves. The dwarves are funny guys and I think she picks up on a lot of that and the prince is a very goofy guy as well. I looked a lot to Audrey Hepburn for the way that she handles herself in her roles. That came through in your performance. Thank you so much. She says so much without saying anything at all, and nowadays we cut so much in films compared to old days when they would focus on an actors face going from one emotion to another. You actually saw the progression. She is so endearing and can make you cry and then she does something really quickly that makes you laugh and you're like, 'Why did I just laugh, but I laughed.' It's quirky human nature and I really wanted to bring some comedic tie to the film because it is a comedic adventure. How boring would it be if the one character in the movie was Snow White and she didn't have any comedy? That wouldn't work for me. You get to have the full princess regalia, the tiara and everything. What was that experience like? Crazy, because that tiara was based off of Grace Kelly's tiara and so it was like an epic moment of having this bow on my dress like a present with this tiara at a wedding. I've never had a wedding onscreen before and that was really weird. Then having all these extras there, all of them in outfits at my wedding ceremony. It was pretty epic and it was really cool because my mom was on set for it and she was off on the sidelines crying. I was like, 'Mom. This is a movie.' But it was so cool and it's so weird to watch it back, because I was just so in the moment doing it, and now I watch it back and I'm like, 'I was so lucky.' I'm pretty sure in the moment I was realizing how lucky I was, but I really hope I took it all in while I was filming because it's so cool. Do you have any notion as to why there's something in the water with fairy tale stories in Hollywood right now? I think with everything that's going on in the world today, the economy, jobs, everything, people want to be taken away for a little while into this kind of dreamlike world. Fairy tales are a perfect blend for kids and adults to get something out of it. Kids get to kind of revel in that mystique and that imagination that they love and adults get to become kids again. They're so fantastical and colorful and bright and there's a history there with fairy tales that when you're an adult you go back to how you felt when you were an innocent child watching these things. Then children may not understand the dark nature of them because most of them are very dark, but they can kind of have fun and laugh with their families. It's a time and a place where families can come together. There's not a lot of activities today that families can do together – and actually WANT to do together.